It was bad enough when the explosion aboard the Deepwater Horizon oil rig claimed the lives of 11 of the 126 crew on board. However, when the rig sank into the waters of the Gulf of Mexico two days later, the situation went from bad to worse. With no rig on top of that oil well, there was nothing to stop the flow of oil from the hole in the ground. 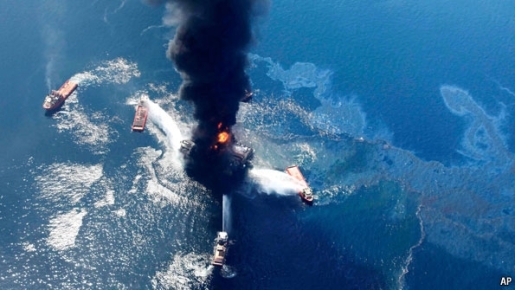 When the remotely-operated shut-off valve failed, the situation went from dire to drastic, and the oil slick off the coast of Louisana has grown to a massive spill, 80 miles across and 40 miles from north to south. Every day the blow-out preventer fails to close, another 42,000 gallons of oil ends up in the water. BP, the company that was leasing the rig, has been very proactive in helping control the leak, with more than 1,000 people from a variety of public and private agencies on the water at the site, but a solution to the problem of leaking oil might be months away. The last thing BP wants at this point is the kind of bad publicity like what’s happening over the Chinese coal ship that crashed into the Great Barrier Reef. Fortunately, in this instance, nature is on our side. The winds are pushing the oil away from Louisana’s rich marshlands and towards the mouth of the Gulf. If it was blowing the other way, or if it shifts before this spill can be gotten under control, then we’re looking at another Exxon Valdez situation.